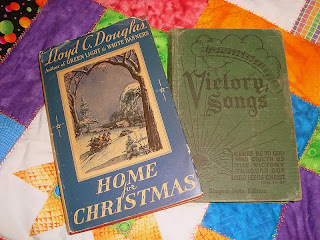 I just love old books, and old song books too! (Of course I had to take a pic of the books on top of the quilt my Momma made for me...she calls my quilt "Stars for Sarah!") These two books in particular were given to me by my Mamaw, after my Great Grandparents Walter and Ruby Gay passed away....they passed away almost exactly a year from one another. Grandma Gay always loved to read, sew and quilt just like I do. Grandpa Gay was always quite chipper and happy like a new fledgling bird...he had to be because he practically had an aviary in his back yard! I miss my Great Grandparents....this Christmas will be hard too...but also filled with so many new wonderful blessings! I have God and love...and so I feel I have the world! 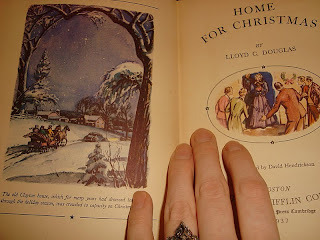 I hope to start reading the little-old-tattered-well-worn-and-very-much-loved book from my Great Grandparents, "Home For Christmas" by: Llyod C. Douglas during this Holiday season. I will cherish this book, as I know they did...many more generations will have come to treasure it as they did and as I do now. I have so much to do, and so little time to do it. So many loved ones to see...and so much love to gain and share. Christmas. Jesus. Love. Being together. Joy! Ah...memories. The well loved tattered book...drawing together family, and dearly loved ones to become a central common thread. I am so joy filled right now...no more mere words can express this gratitude and warmth within my heart!